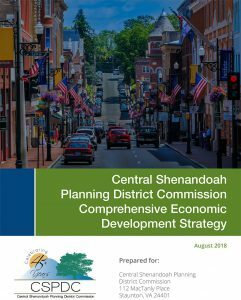 The Central Shenandoah Planning District Commission is a designated Economic Development District (EDD) under a program administered by the U.S. Department of Commerce’s Economic Development Administration (EDA). One of the CSPDC’s primary responsibilities as an Economic Development District is to prepare a Comprehensive Economic Development Strategy (CEDS) for the District. A key component of the CEDS is to establish and maintain a robust, diverse economic ecosystem. The CEDS provides a platform for individuals, organizations, local governments, institutes of learning, and private industry to engage in a meaningful conversation about how local strengths can be leveraged to improve overall quality of life and how barriers can be overcome to achieve goals. 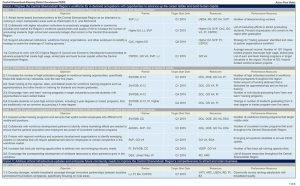 Establishing regional economic development goals through an intensive planning process is not only important in terms of setting roles and responsibilities among stakeholders, completing an EDA-approved CEDS unlocks federal and state funding sources that are invaluable to localities who may not otherwise have access to capital. 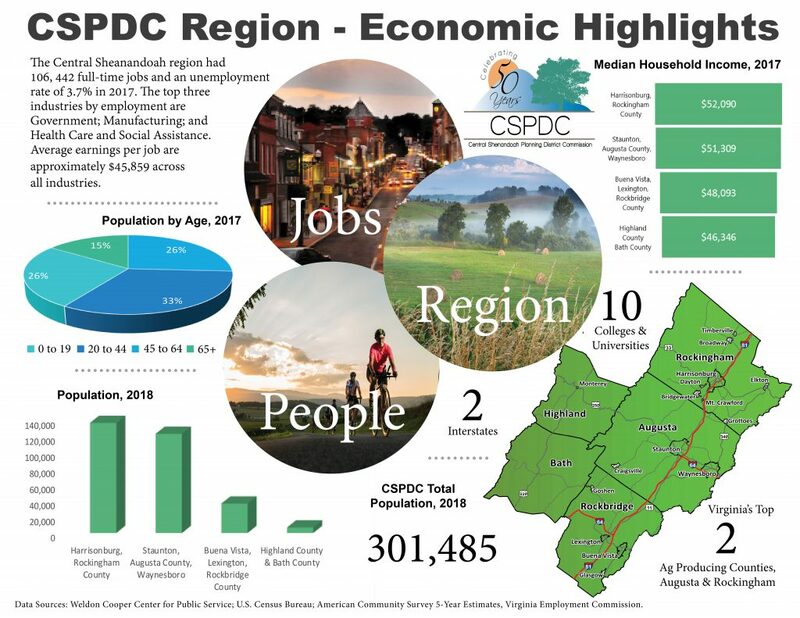 The Central Shenandoah Region is an area rich in employment opportunities, natural resources, and economic assets that can support sustainable growth into the future. Every corner of the Central Shenandoah Region is diverse in its geography and industry mix, which is part of what makes the region enticing to residents and businesses alike. Focused on sustaining and enhancing these characteristics, the CSPDC engaged in a CEDS to pursue strategy-driven regional economic development. The CEDS serves as a roadmap to guide the region in achieving their vision. The CSPDC'S CEDS contains five ambitious visions, which are outlined on the following pages. Beneath each vision are goals, which help define how that vision will be achieved. Nearly every goal requires collaboration from not only localities, but regional economic development and planning partners. Vision I: Prepare the Central Shenandoah Region’s workforce for in-demand occupations with opportunities to advance up the career ladder and build human capital. Expand the workforce talent pool in the Central Shenandoah Region by attracting new residents and retaining workers. Partner with local industry to engage students and recent graduates to change the culture around careers available to students locally. Enable the growth of programs that recognize the potential of the local workforce to upskill and climb the career ladder. VISION II: Address critical infrastructure updates and anticipate future community needs to improve the Central Shenandoah Region’s competitiveness to attract and retain business. Expand and improve the Region’s technology and telecommunications systems. Maintain and improve transportation networks that carry goods and people throughout the Central Shenandoah Region. Invest in site improvements by focusing on essential infrastructure upgrades or installation. Diversify housing options within the Central Shenandoah Region. VISION III: Expand and diversify economic activity in the Central Shenandoah Region by focusing on developing physical assets and cultivating natural resources. Encourage the diversification of new and existing industries to ensure economic resiliency. Support business attraction and retention efforts in the Central Shenandoah Region. Enhance natural resources, heritage sites and other outdoor recreation elements throughout the Region to promote quality of life, increase visitation and spur the outdoor recreation economy. Create, improve, and renovate downtown corridors or other significant centers of activity to be economically productive. VISION IV: Grow agribusiness by expanding the markets for farmers, producers, food manufacturers, and other related sectors, like forestry, in the Central Shenandoah Region and beyond. Collaborate with agribusiness to understand challenges facing their production and strategies to improve their business. Support resources and programs to grow the agritourism sector. VISION V: Increase resilience to natural and man-made hazards, economic downturns, and social vulnerabilities that impact communities and businesses in the Central Shenandoah Region. Make the Region more resilient through planning, education, and mitigation activities. Facilitate strategic land use to mitigate negative effects of natural disasters on residents and businesses. Diversify regional funding assistance and federal funds to strengthen organizational capacity in times of stability and disaster efforts. The planning process was initiated with the understanding that developing relationships among stakeholders in the public and private sector would be essential for successful implementation. The factors, partners and other resources expected for implementation are detailed in the Action Plan Matrix. Potential funding sources are identified so that the organization can launch into implementation from planning. CSPDC anticipates taking on the role of facilitator, while enabling local experts to take on goal areas that match their expertise. Additionally, each objective has a performance measure, which will be updated along with other necessary elements during each annual review of the CEDS required by the Economic Development Administration. For more information please contact the CSPDC offices.